Pumpkin curry is one of my favorite Thai dishes. Typically it is made with canned pumpkin and full-fat coconut milk, however this recipe uses light coconut milk, which has about one-third of the calories and fat than regular coconut milk. The curry is not as rich as it would be using regular coconut milk, but this dish is very flavorful and healthier. Fresh pumpkin is also used, since it is autumn and pumpkins are in season and this makes for a great warm dish for the cooling autumn evenings. I find this dish filling on its own though you can serve it with rice as it is done in Thai restaurants. 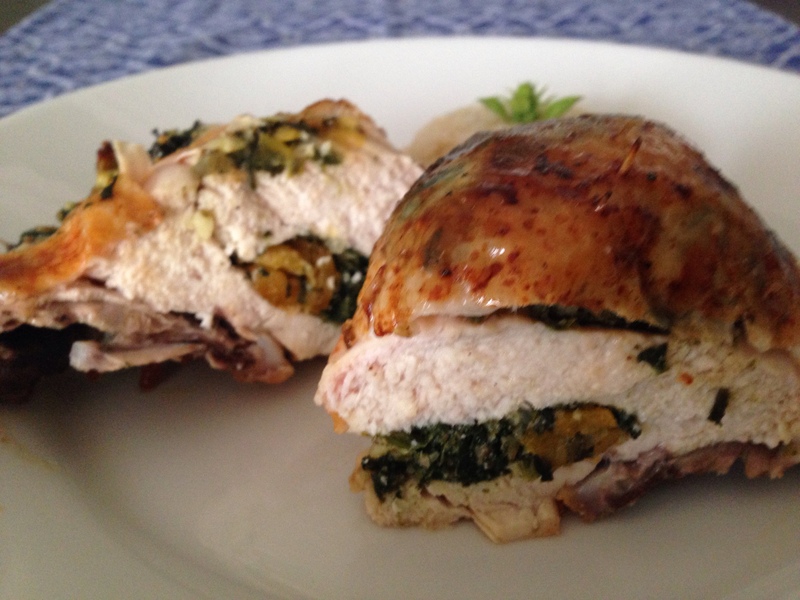 I used Kabocha squash also known as Japanese pumpkin for this recipe. 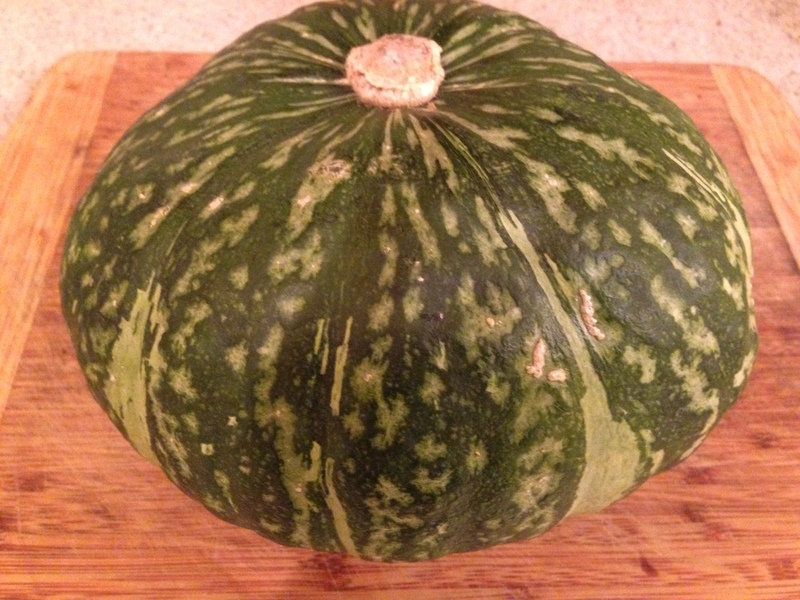 Kabocha pumpkins are green on the outside and typically weigh about 3 pounds. They are popular for their strong yet sweet flavor and moist, fluffy texture. You can easily substitute the orange pumpkin varieties that you find around Halloween. 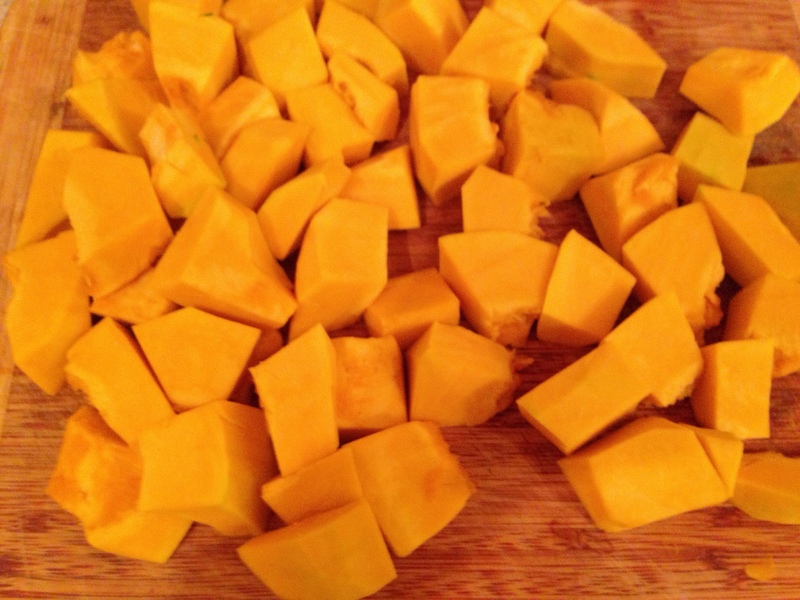 This curry recipe calls for 4 cups of pumpkin, skinned and cut into about 1 inch pieces. I used about 2/3 of the 3.5 Kabocha squash. The first step in making this curry is to sauté the chicken for a couple of minutes – about one minute on each side. The chicken will be only partially cooked, as it will finish cooking in the curry sauce. I do this as it keeps the chicken tender. One pound of chicken tenders are cut into pieces, about 1/3 each. You can buy whole boneless and skinless chicken breasts and cut them into pieces, if you prefer, but the tenders are pre-cut which makes it quick and easy. After you remove the chicken from the pot, you’re now ready to make the curry. To the pot with the reserved oil, add the garlic and ginger and sauté for one minute, then add the light coconut milk, Thai red curry paste, turmeric, lemongrass, sugar, Kaffir lime leaves and the fish sauce (use a light colored fish sauce as it is better quality) and bring to a simmer. Then add chicken stock and mix through. Add the pumpkin and chicken and bring to a simmer. 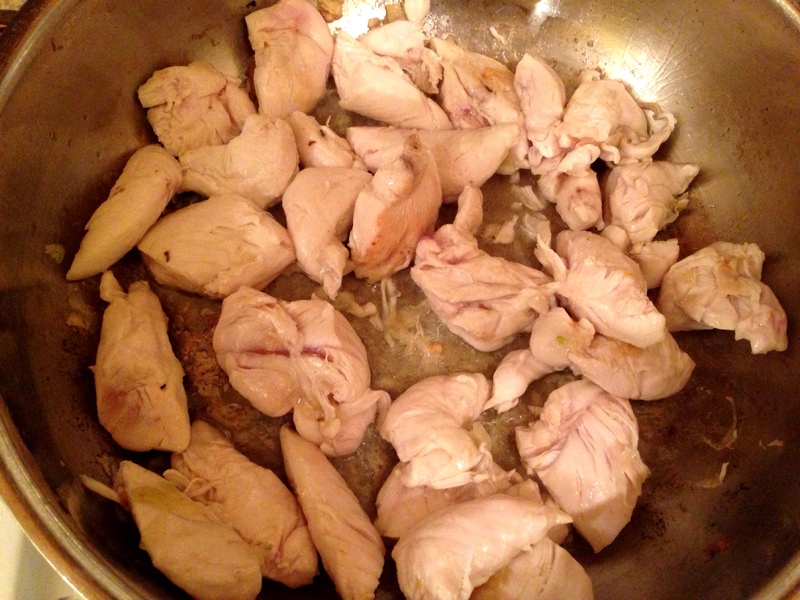 Cover the pot and cook for 4 minutes so the flavors mesh and the chicken is cooked through. 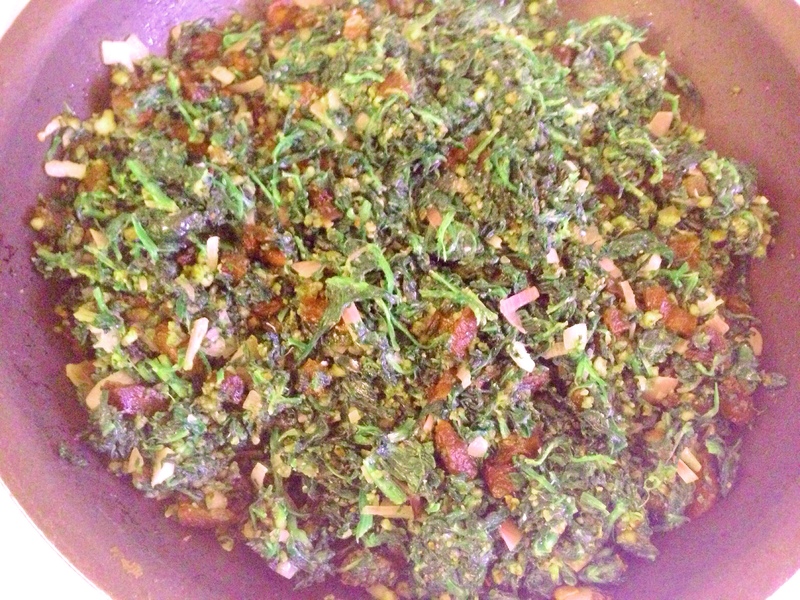 Remove the lemongrass pieces and Kaffir lime leaves from the pot and add the vegetables. This recipe calls for mushrooms, Bok Choy and red bell peppers, but you can use any vegetables you want. Cover the pot and simmer for 4 more minutes until the vegetables are cooked through. Add the juice of the lime and mix through. 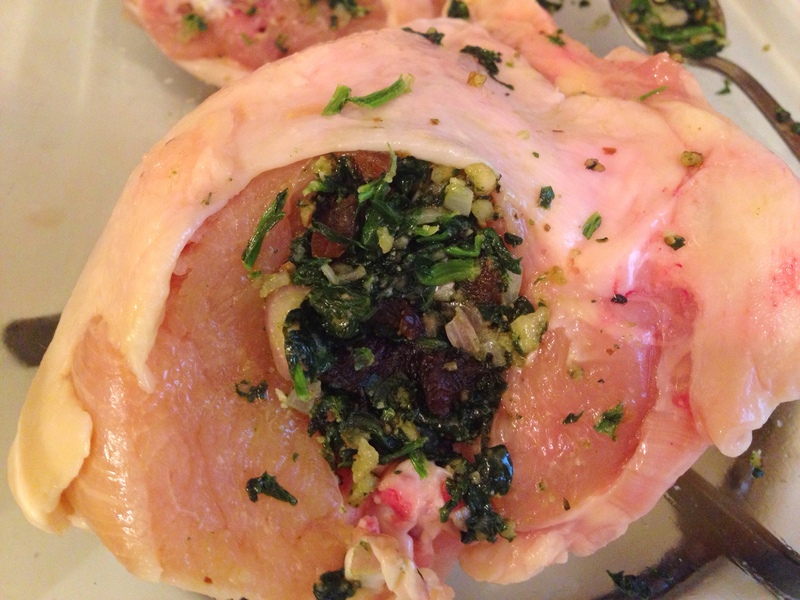 Serve with chopped cilantro to garnish, and rice if you want a more filling meal. Heat oil in a pot on medium-high flame until hot. Add chicken and fry for 1 minute on each side and remove from pan. To the pot, add garlic and ginger and sauté for 1 minute. 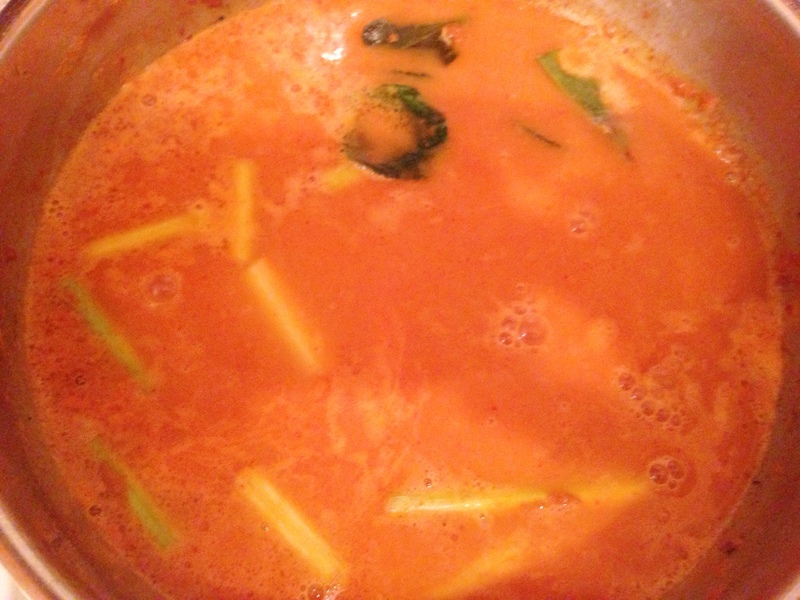 Add coconut milk, Thai curry paste, turmeric, lemongrass, sugar, lime leaves and fish sauce to the pot and bring to a boil. Add the chicken stock and mix through. Add the squash to the pot along with the chicken and simmer covered for 4 minutes. 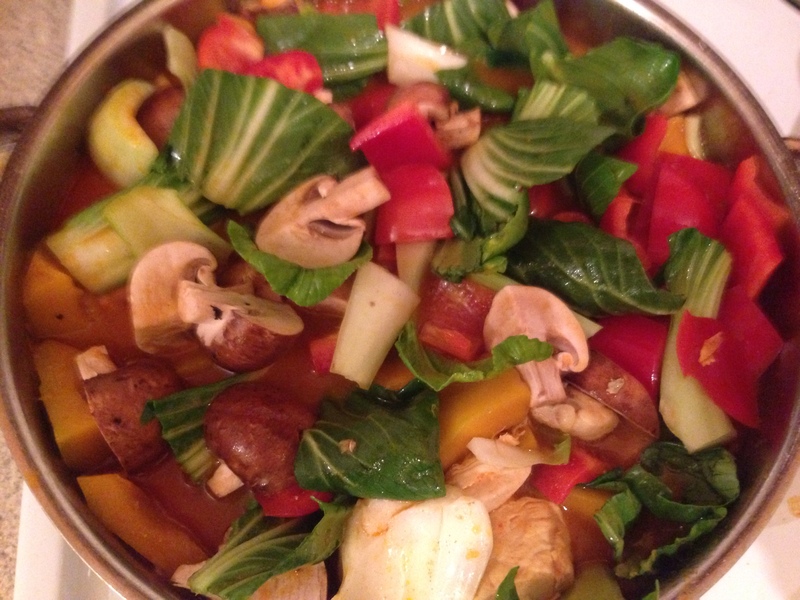 Then remove lemongrass and lime leaves and add the mushrooms, Bok Choy and red pepper and cover simmer for 4 more minutes. Add the juice of the lime and mix through. Serve with chopped cilantro to garnish and rice if you want. 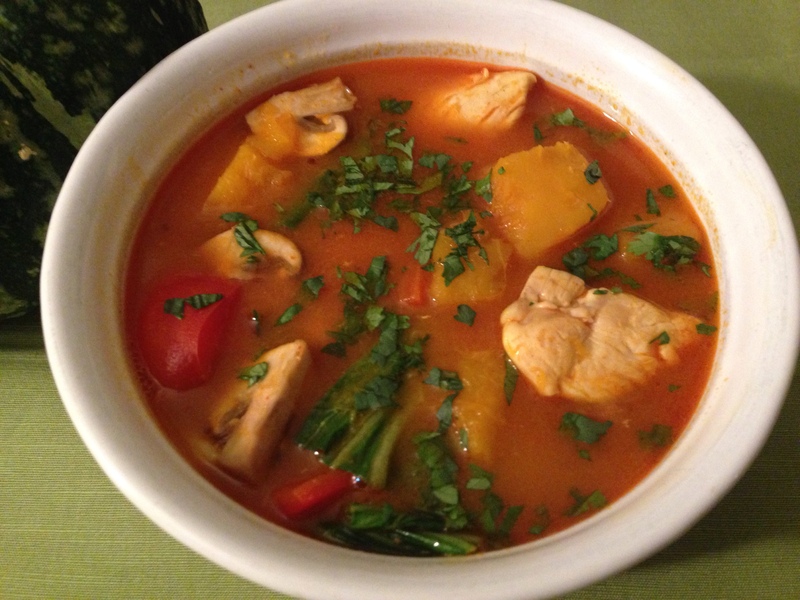 This entry was posted in Blog, Recipes and tagged Chicken, Kabocha, Kaffir lime leaves, lemongrass, pumpkin, pumpkin curry on September 29, 2014 by Leslie. This Indian-inspired vegetarian dish is hearty enough for a full meal. It’s easy to make and uses spices used in traditional Indian cooking. Garam Masala is a key ingredient along with additional Turmeric powder, which, along with the pumpkin, gives the dish a nice golden color. Sour cream is used as an accompaniment to balance the heat from the Cayenne pepper and add creaminess to the dish. I used Kabocha squash also known as Japanese pumpkin for this recipe. They are popular for their strong yet sweet flavor and moist, fluffy texture. 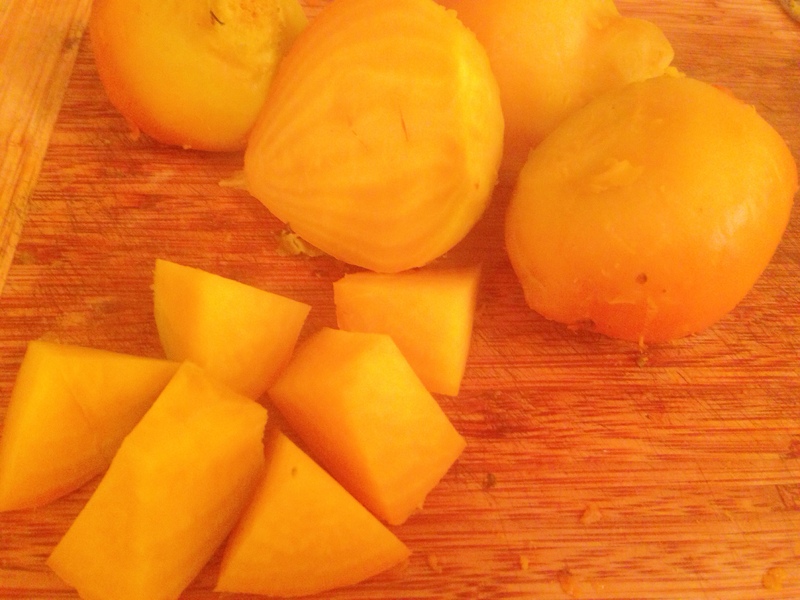 You can easily substitute butternut squash or orange pumpkin for the Kabocha squash. 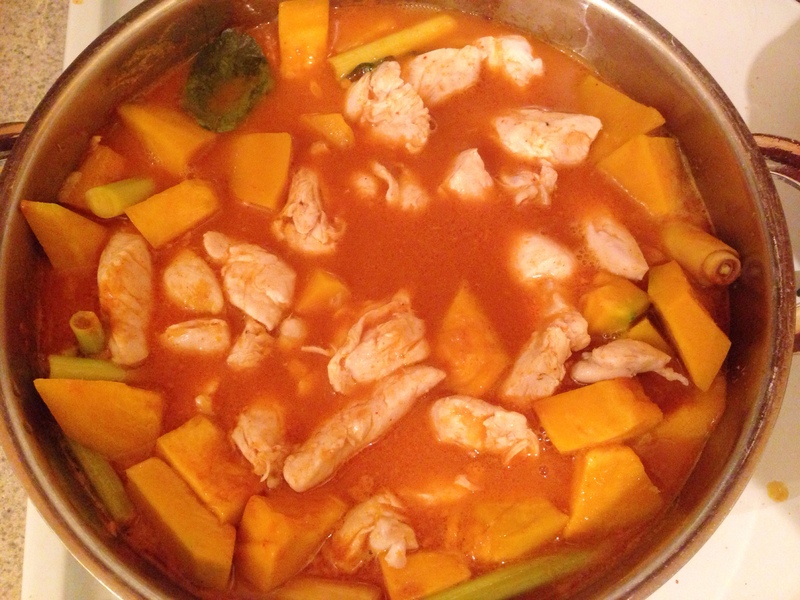 I made this recipe with the left over Kabocha squash from the Pumpkin Curry with Chicken recipe. Garbanzo beans round out the dish and adding to the heartiness of a full vegetarian meal. To make this dish, sauté the onion, garlic, and ginger in the oil until the onion is soft. 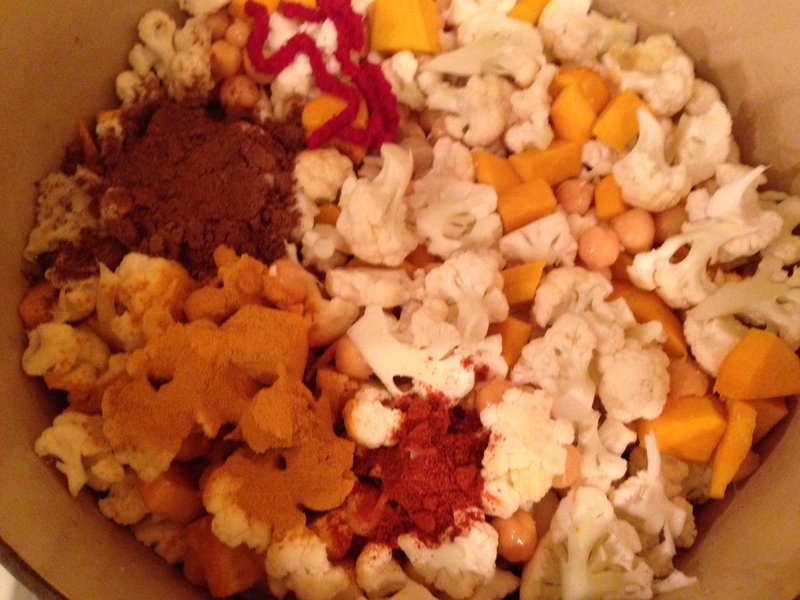 Add the cauliflower, pumpkin, garbanzo beans, Garam Masala, turmeric, Cayenne pepper and tomato paste and mix through. Add the chicken stock and mix through again. 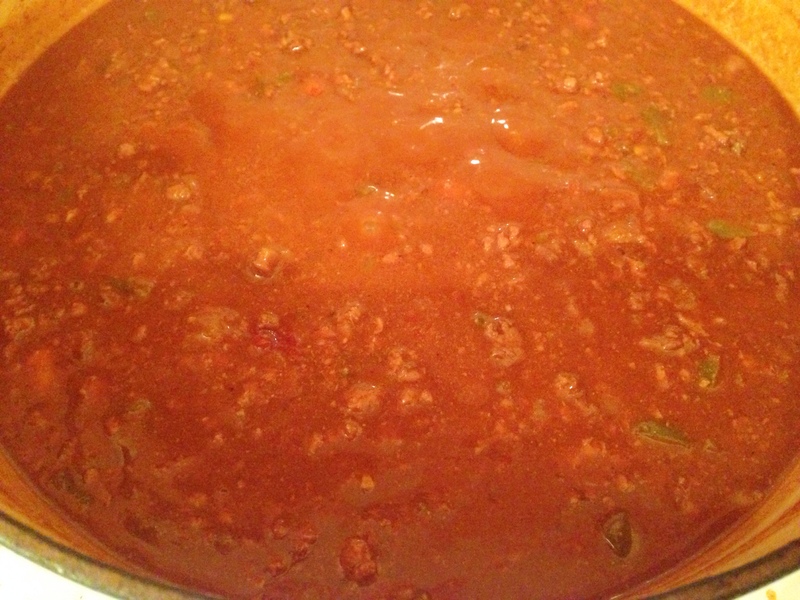 Cover and cook on medium-low heat for about 30-35 minutes, until the liquid has cooked down and the consistency resembles a thick stew. The Serve with sour cream and garnish with chopped cilantro. In a Dutch oven on the stovetop sauté the onion, garlic, and ginger in the oil on medium heat until the onion is soft. Add the cauliflower, pumpkin, garbanzo beans, Garam Masala, turmeric, Cayenne pepper and tomato paste and mix through. Add the chicken stock and mix through again. Cover and cook on medium-low heat for about 30-35 minutes, until the until the liquid mostly absorbed and the consistency resembles a thick stew. Serve with sour cream and garnish with chopped cilantro. 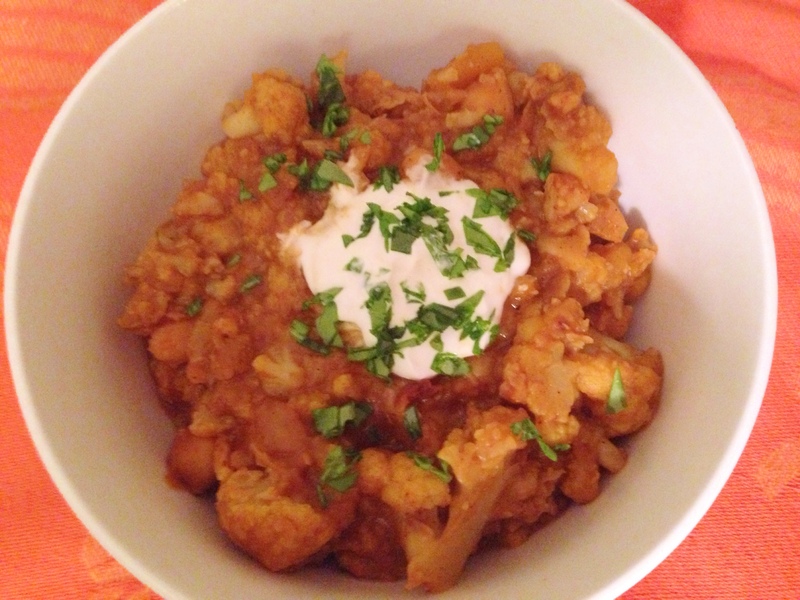 This entry was posted in Blog, Recipes and tagged Cauliflower, Garam Masala, garbanzo beans, Kabocha squash, pumpkin, Turmeric on September 29, 2014 by Leslie. Here’s a quick and easy tapenade to make that’s great for snacking on as you watch Sunday football or to serve as an appetizer before dinner. Canned artichoke hearts are dressed with some red onion, garlic, lemon juice and zest, capers, Parmesan cheese and EVOO, plus some salt and pepper. Mix all ingredients in a food processor and process until fully blended and has a semi smooth consistency, then refrigerate for 2 hours or overnight, so the flavors meld before serving. Mix all ingredients in a food processor and process until fully blended and has a semi smooth consistency, then refrigerate for 2 hours or overnight, so the flavors meld before serving. 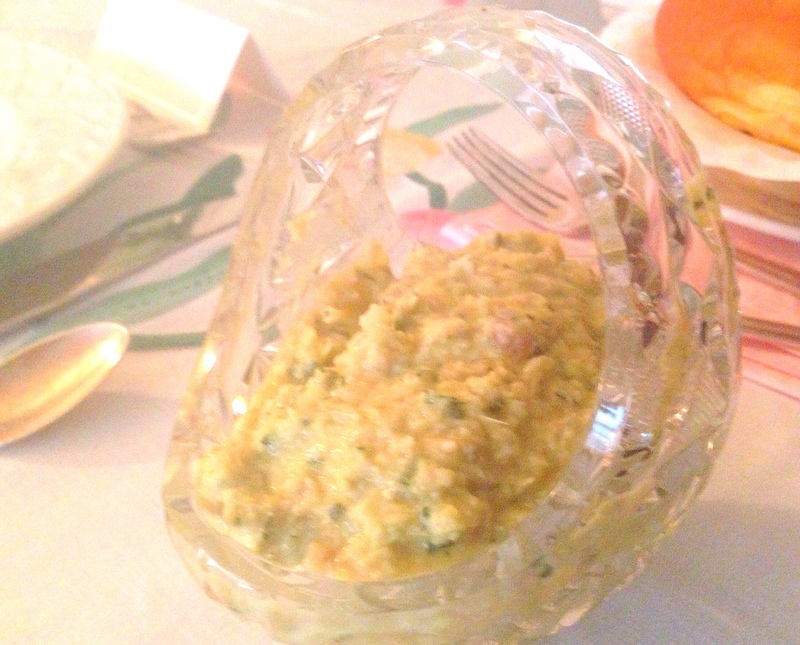 This entry was posted in Blog, Recipes and tagged artichoke, tapenade on September 29, 2014 by Leslie. I had never eaten a beet until I moved to California 18 years ago. Up until that point, beets were something you would see in every Jewish deli in Brooklyn. They were not necessarily presented as something very appetizing. My mother never made beets. And I never saw anyone I knew eat beets until I was around 10, when I saw my now brother-in-law, eat the beets at our favorite neighborhood deli. And I remember thinking…eeew. Fast-forward nearly 30 years and I find myself in the fresh-from-the-farm food Mecca of San Francisco where beet salads are a staple on gourmet California-cuisine menus. Having met some foodie friends when I first moved here, I got the nerve to try beets and found that I really liked the earthiness flavor and hearty texture. The beautifully rich hues of purple-red and orange-yellow brighten up any bunch of greens. There are many variations of beet salads. Some use red beets, others golden, some add cheese such as goat cheese or feta. I prefer this salad simple and golden, and I love the licorice-flavor of fennel and the sweetness of figs to balance the earthiness of the beets. The dressing for this salad is simple and combines the tanginess of orange juice and apple cider vinegar with the sweetness of honey. To make this salad, first rinse and wrap the beets individually in aluminum foil and roast them in a baking pan in the oven for about an hour. When the beets are done and cool enough to handle, peel the skins using the side of a fork to scrape way the skin. Then slice the beets into half-inch pieces and add them to a bowl. Slice the fennel bulb in about 1/8 inch thickness and add them to the beets. 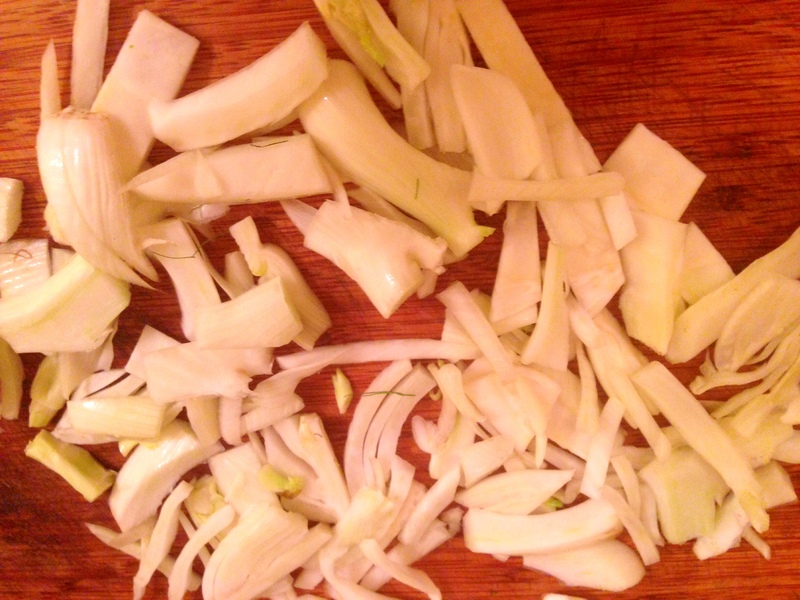 The fennel will separate into pieces, but that is okay. Combine all ingredients for the dressing and pour over the beets and fennel, and refrigerate until the beets are cool – about an hour and a half. When the beets are chilled, take out of the refrigerator and slice the figs into quarters and add to the bowl with the beets and mix the dressing through. Place the watercress on the platter and spoon the bets, figs and fennel over the watercress and drizzle the remaining dressing on top. Wrap beets in foul bake at 400 for 40-60 minutes depending on size of beets. Until a knife goes through the beet with ease. Using the side tong of a fork, scrape away the outer skin of the beets. Then slice into pieces about 1 inch size add to bowl. Slice the fennel and add to the bowl with the beets. Then mix all ingredients of the dressing and pour over the beets and fennel and refrigerate until beets are cool – about an hour and a half. When ready to serve, cut figs into quarters and add them to the beets and fennel and mix through to cover with the dressing. Place watercress on bottom of platter or bowl, and spoon the beets, figs and fennel over the greens. Drizzle remaining dressing on top and serve. 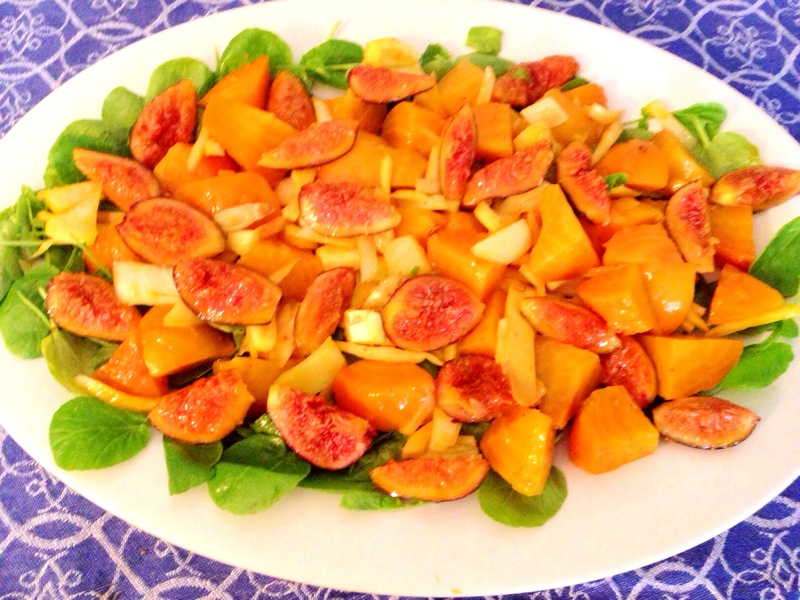 This entry was posted in Blog, Recipes and tagged fennel, figs, Golden beets on September 1, 2014 by Leslie. In the beginning of June, I received an email from Miner Family Winery about a chili cook-off. Since I was about one year into my blog and creating recipes each month, I thought I would challenge myself and give the competition a try. I had never entered a competition like this before. The only requirements were that the recipe had to be submitted by a specific date and the recipe had to use one of Miner’s wines. I love chili and I love spice, but I did not have an old standby chili recipe and I had never made chili with wine before. So after some thought into what would make for a good chili made with wine, I decided on short ribs and ground turkey. Yes, this recipe definitely falls into the “naughty” category, as short ribs and healthy don’t kind of mix… but short ribs do make for a very tasty chili. 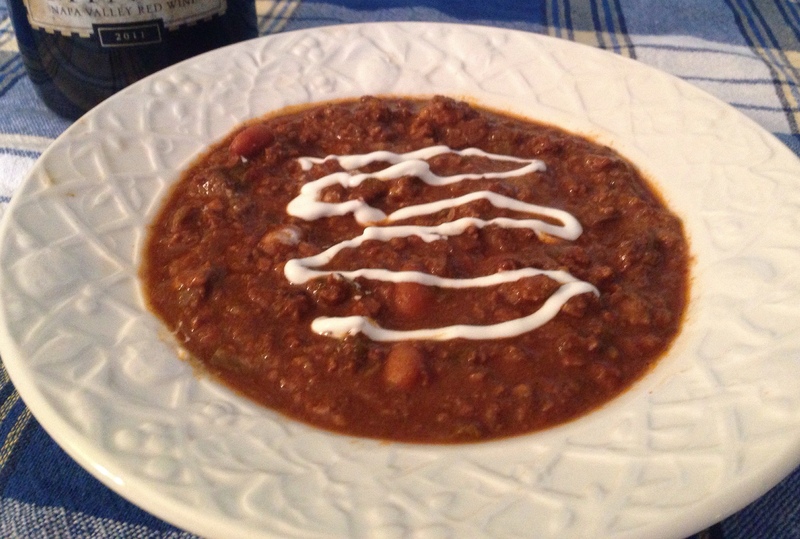 I used Miner’s Odyssey wine in this chili; it’s a Rhone style red wine. It worked really well with the short ribs. Well enough to win third place in the cook-off! The prize was a magnum of Miner’s Rosato wine. This “award-winning” chili is made with a variety of chilies: jalapeños, California chili powder, cayenne chili powder, paprika. The jalapeños and cayenne provide a really good amount of heat. Dried California entero peppers are also added, rounding out the chilies and the dish. These peppers do not provide much heat, but they add a lot of body to the chili. Whole pods are cooked in the chili and then halfway through the cooking stage, the peppers (minus the stems) are puréed with some cooking liquid and then added back to the chili pot and mixed through. I use 2 big peppers or 3 small peppers for this recipe. If you cannot get the dried California entero pepper pods, you may substitute them with Guaijillo chilies, which are a bit spicier so you may need to watch the heat. 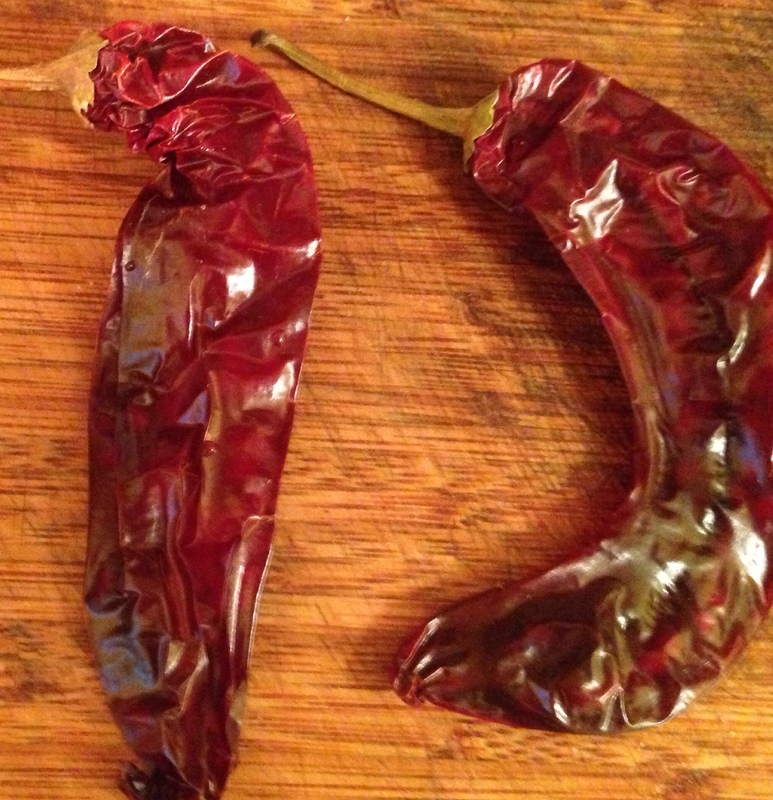 You can also buy California entero chilies online. English-cut short ribs are used for this recipe. 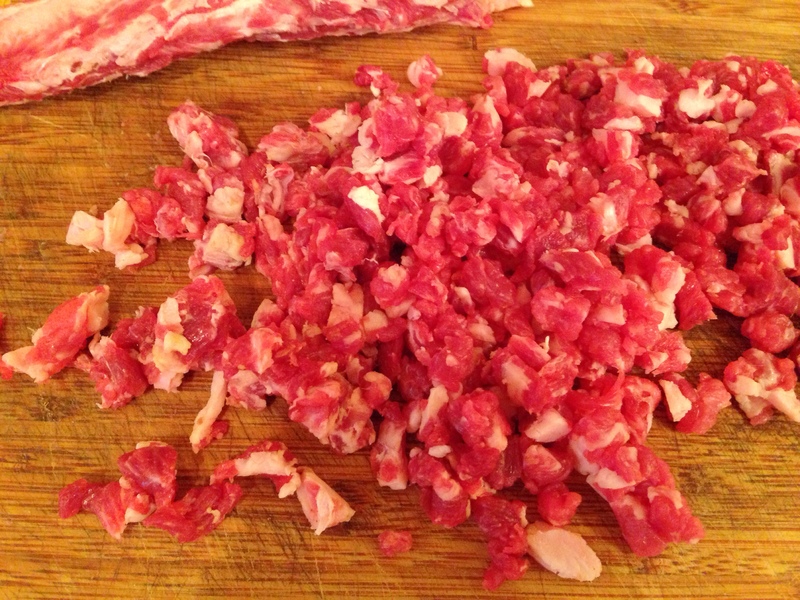 The meat is diced into 1/8 pieces prior to cooking to This helps the short rib meat blend with the ground turkey so that each bit has both types of meat. To prepare the short ribs, trim the fat and slice the meat off the bones. Then dice the short rib meat into about 1/8″ pieces. Reserve the bones, as they will be added to the pot to flavor the chili. Taking the up front in browning and belying if the short ribs, turkey and peppers and onions will help keep the chili consistent and balanced with turkey and short ribs in each bite. Add the short rib pieces to the heavy pot and sauté for 2 minutes over medium heat, until meat is brown. Add the green bell pepper, jalapeños, and onions to the pot and sauté for 3 minutes. Add the spices and mix through thoroughly and sauté for 2 more minutes. Then, add the ground turkey and mix through thoroughly breaking up the turkey so that they turkey combines with the rib pieces and the onion and peppers. Sauté for another 5-7 minutes until the turkey is browned. Then add the wine, coffee and tomato sauce and mix through add the dried California entero peppers and add the short torn bones and submerge I to the liquid. Cover pot and simmer, mixing though occasionally. Trim top layer of fat off of short ribs and slice the meat of the bones and dice the meat into very small pieces – about 1/8” in size. Reserve bones, to add when cooking the chili. Combine cumin, chili powder, cayenne pepper, salt, paprika in a bowl and set aside. Add short rib meat to a Dutch oven on medium-high heat and sauté 2 minutes, until meat is browned. Add the diced onion, green bell pepper and jalapeno peppers to the pot, mix through and sauté for 3 minutes. Add the spice mixture and mix through and sauté 2 more minutes. 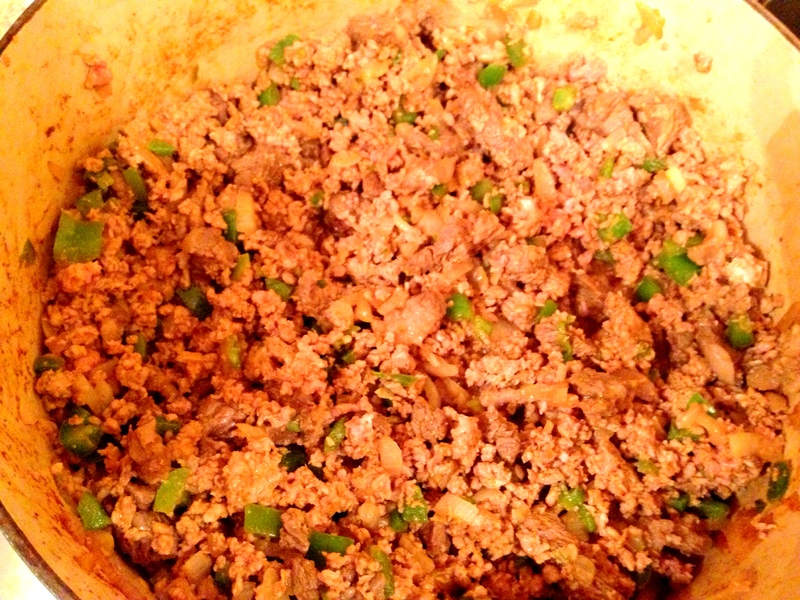 Add ground turkey and mix though thoroughly so that the turkey and short rib combine with the onions and peppers in small pieces. Mixing thoroughly for about 5-7 minutes until al the turkey is browned. Then, add the wine, coffee and tomato sauce, and mix through. Add the California entero peppers and the bones from the ribs and submerge the peppers and bones into the liquid. Cover and cook on a simmer for 1.25-1.5 hours. Take out the California entero chilies from the pot, discard the stems and place the peppers with about 1 -1 ½ cups of cooking liquid into a blender and puree. Add pureed mixture back to pot and mix through. Add 3 tablespoons of masa harina to one cup of warm water mix until combined and smooth, then add to the pot along with 2 teaspoons of cocoa powder and the beans, and mix everything through. Cover and simmer for another 75-90 minutes. Serve with sour cream on the side. 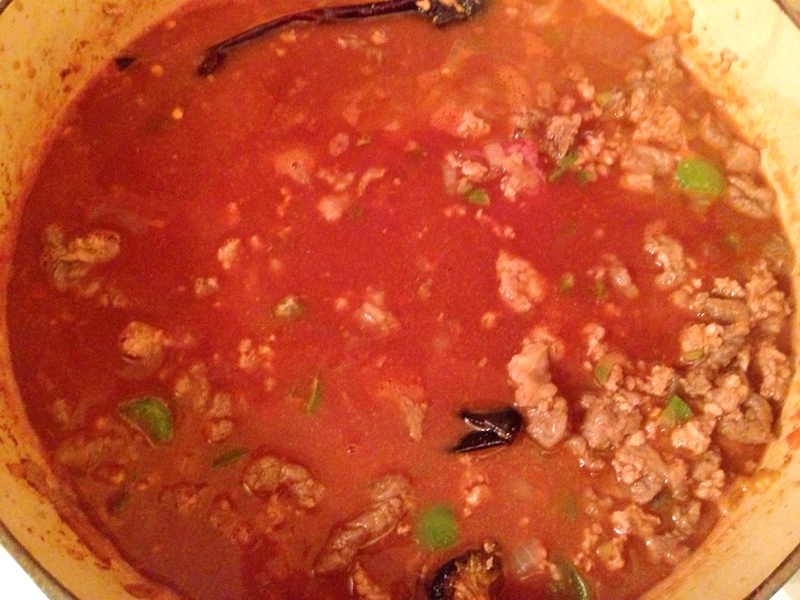 This entry was posted in Blog, Healthy Living and tagged Califonia chili powder, California Entero Chilies, Chili, Ground Turkey, short ribs on September 1, 2014 by Leslie. This non-mayonnaise-based shrimp salad is perfect for a balmy day, offering protection from heat spoilage that most shrimp salads are vulnerable to. 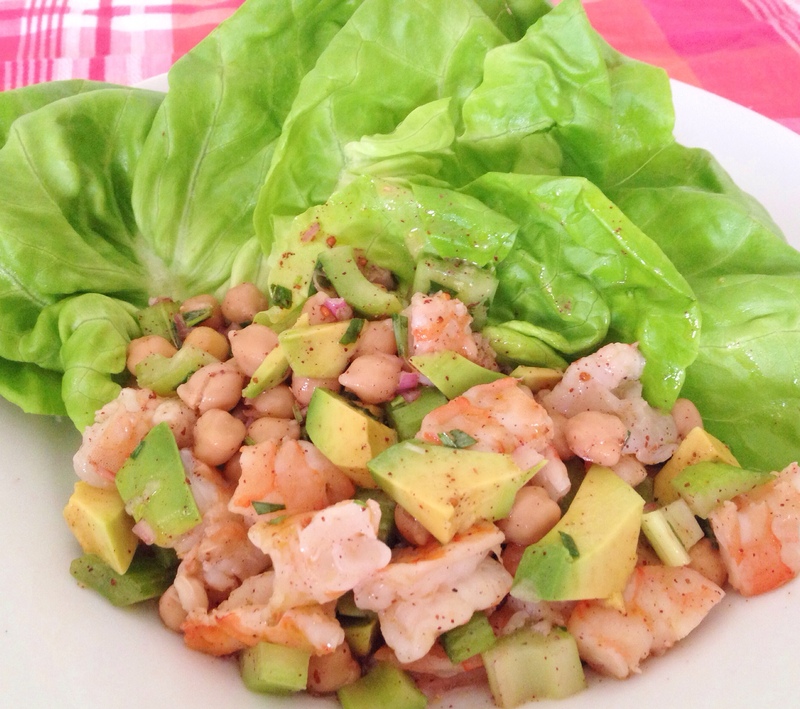 The ingredients for the salad are simple: grilled shrimp, celery, garbanzo beans, avocado and butter (Bibb) lettuce. A light but flavorful dressing made with Tarragon and Sumac give the salad a great punch of flavor. This recipe calls for the salad to be served chilled, but it also works as a warm salad with the freshly grilled shrimp added right before serving along with the avocado and placed on top of the butter lettuce. The key to the keeping the shrimp moist is to grill the shrimp with their shells on, for just 2 minutes per side, just until the shells are pink and the inside opaque. To prepare the shrimp, slice through the outside shell to butterfly the shrimp and devein. 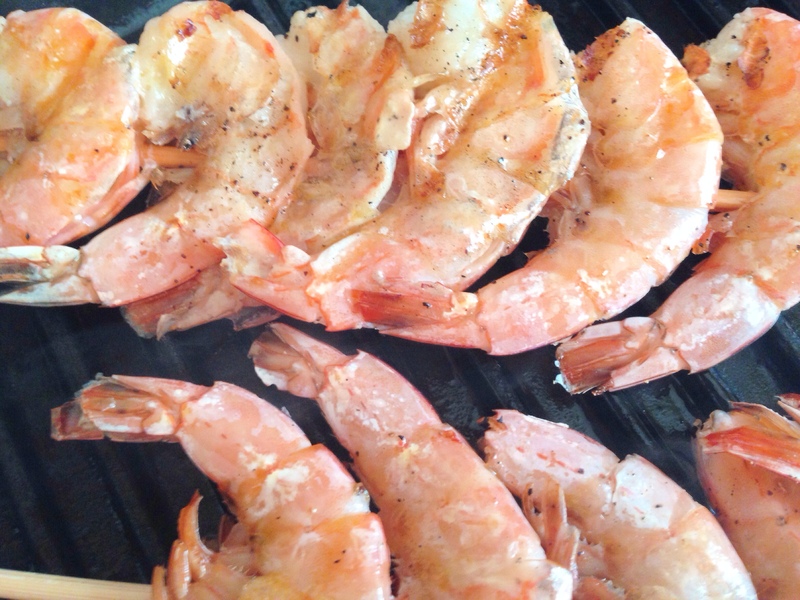 Try to keep the shells in tact as much as possible so the shrimp do not dry out on the grill. Layer the shrimp on two skewers to ease the grilling process. Several strong flavors come together in this dressing, providing a great complement to the garbanzo beans, celery and shrimp. Tarragon offers an anise-like accent to the dressing, while the sumac – typically found in Middle-Eastern dishes – provides a tangy citrusy flavor. Chopped shallot, lemon juice and whole grain mustard round out the flavors, mixing well with the EVOO and red wine vinegar. To make the salad, chop the celery lengthwise in half and then cross-wise in 1/4″ pieces and add to bowl along with the garbanzo beans. Add the dressing and let sit until the shrimp has been cooked. Then add the peeled, chopped shrimp and refrigerate for one to one and a half hours so the shrimp has chilled and the flavors meld. If you do serve the salad with the hot freshly grilled shrimp, refrigerate the beans, celery and dressing for 30 minutes prior to making the shrimp. To serve, add the diced avocado to the salad and mix through to coat with dressing. Place leaves of butter lettuce on top of two plates and spoon the salad on top of the lettuce and drizzle with remaining dressing. Make dressing by combining the shallot, EVOO, vinegar, lemon juice, sumac and mustard. 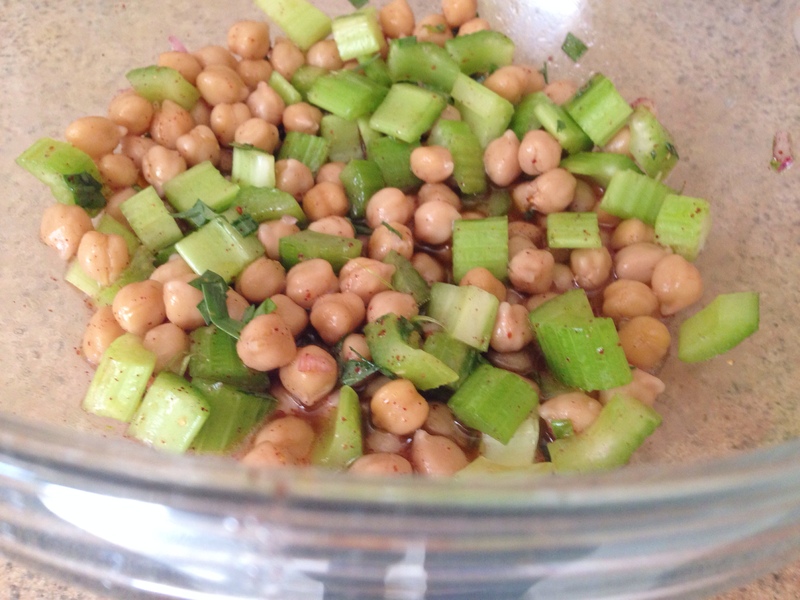 In a bowl, add the garbanzo beans and celery and add the dressing, mixing through. Refrigerate for 30 minutes, if serving the salad with warm, grilled shrimp. If serving the salad cold, then add the cooked, chopped shrimp to the bowl, mix through and refrigerate for 2 hours. To grill the shrimp: Cut a slit into the back of the shrimp shell and butterfly and devein, keeping shells in tact so that the shrimp remains juicy when grilled. Thread the shrimp on two skewers. Brush the shrimp with EVOO and add salt and pepper. Grill on high heat for 2 minutes on each side, just so the shrimp is opaque and the shells are pink. Remove shrimp form the skewers, discard shells and chop the shrimp into large chunks, about 3 pieces per shrimp. Add shrimp to bowl with beans and celery and mix through. Refrigerate 1 – 1 ½ hours until the shrimp is chilled and the flavors meld. When ready to serve, cut the avocado into 1/4″ pieces and add to the salad and mix through. Divide the lettuce into 2 and place the leaves on 2 separate plates and spoon the salad on top of the lettuce drizzling the remaining dressing onto the lettuce leaves. To serve this salad with warm, freshly grilled shrimp. Prepare the dressing, beans, and celery and refrigerate for 30 minutes. Then prepare shrimp and add it while hot along with the avocado and mix through so the dressing coats. Then place on top of the lettuce and drizzle the remaining dressing over the lettuce. This entry was posted in Blog, Recipes and tagged butter lettuce, garbanzo beans, shrimp, Sumac, tarragon on July 29, 2014 by Leslie. Cold watermelon is one of the most refreshing foods you can eat on a hot summer day. It’s sweet and light and comprised mostly of water. These days, seedless watermelons are pervasive but I actually prefer the ones with seeds, as the taste and sweetness tend to be stronger. 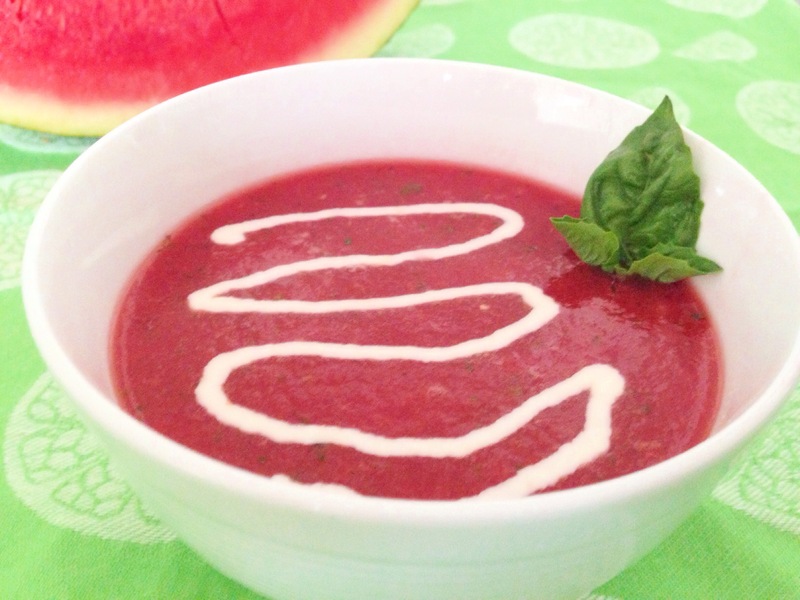 This recipe for watermelon soup, however, works perfectly fine with the seedless watermelon, and it makes it much easier to make. This chilled watermelon soup with feta cream is a great snack or a great first course for a summertime lunch or dinner. Fresh mint and basil are puréed with the watermelon, providing the right balance of seasoning to make the watermelon more savory. 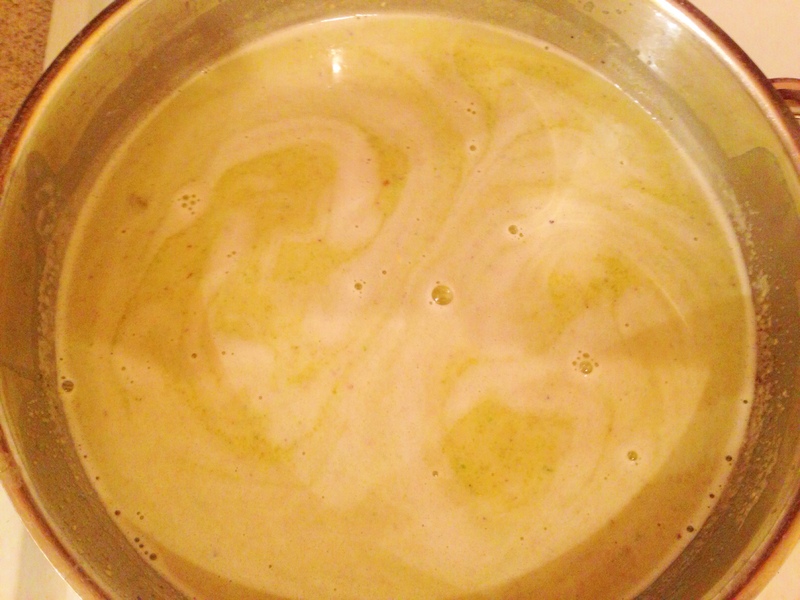 Honey and red wine vinegar provide the sweet and tangy balance which gives the soup added depth. When pureeing the watermelon, make sure to use a blender and not a food processor, as the blender results in the right consistency and the food processor makes it too watery. Feta cream finishes this soup and when combined, adds a nice bit of a creaminess to the texture. I tend to not put too much, as the soup should be light and not too creamy. The balance I use is about one tablespoon of feta for about a cup and a half of soup. To make the feta cream, lemon zest, lemon juice and olive oil serve as flavoring agents for the feta cheese. All ingredients, plus a bit of low-fat milk to help thin out the feta cheese, are combined in a food processor. The end consistency is thin enough to drizzle on top of the soup. The key stage in this recipe is giving the soup enough time to chill in the refrigerator for the flavors to really meld. Two hours gives it ample time. The feta cream is kept separate and added just before serving. This recipe makes for extra feta cream, which will keep in the refrigerator for about 5-7 days, and can be easily added to salads and other dishes. The soup will keep in the refrigerator about 3-4 days. To make the soup: combine all ingredients in a blender and puree – you will need to do this in 3-4 batches. Transfer to a covered bowl and refrigerate for 2 hours until the flavors meld. 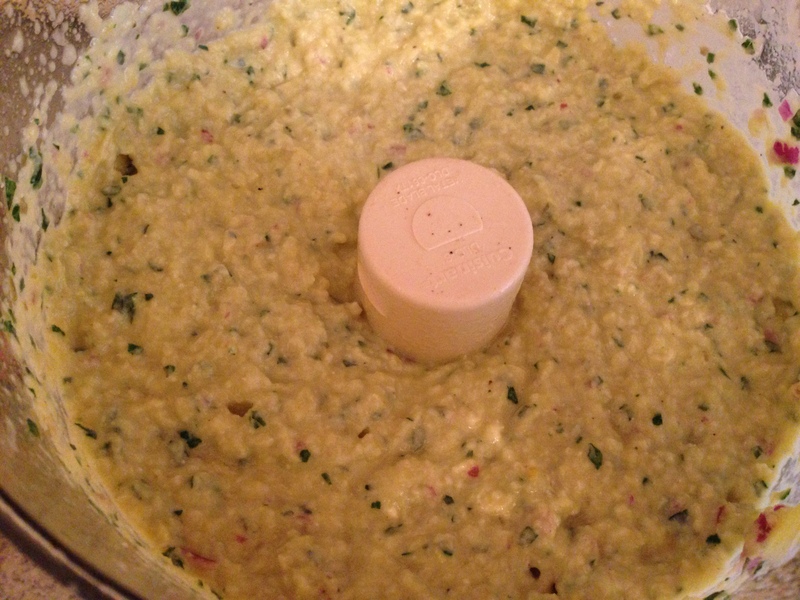 To make the feta cream: combine all ingredients in a food processor and process until creamy. Refrigerate for until ready to serve the soup. To serve: drizzle feta cream on top of soup in individual bowls. 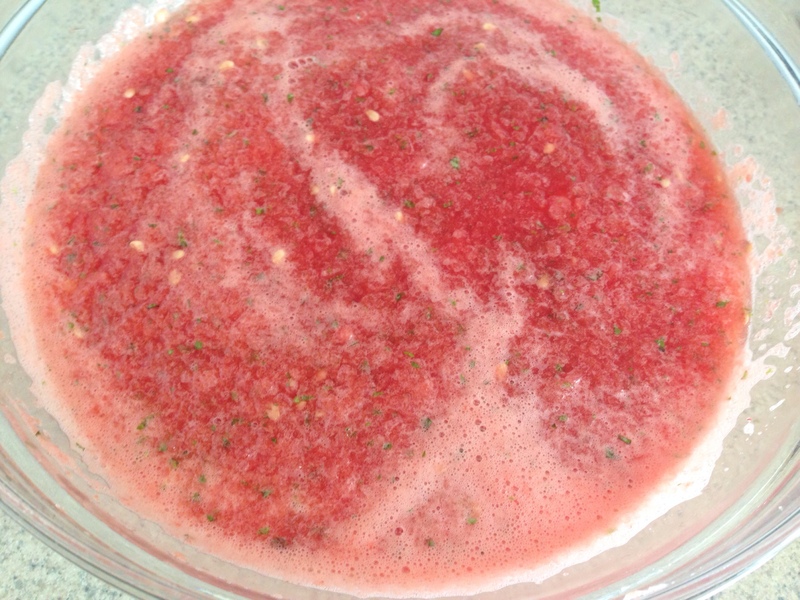 This entry was posted in Blog, Recipes and tagged chilled soup, feta, watermelon soup on July 29, 2014 by Leslie. The best food-related aspect about the summer heat is the case it makes for eating ice cream. If you’re going to be naughty, ice cream is the food to eat. My favorite ice cream flavor is pistachio. I think it goes back to my days growing up in Brooklyn, where Italian spumoni was popular. If your not familiar, spumoni is a molded Italian ice cream made with layers of different colors and flavors, usually containing candied fruits and nuts. The ice cream layers are often cherry, pistachio, and either chocolate or vanilla. These days I don’t often get spumoni or even see it offered, but I still order the pistachio-chocolate ice cream mix when I splurge. 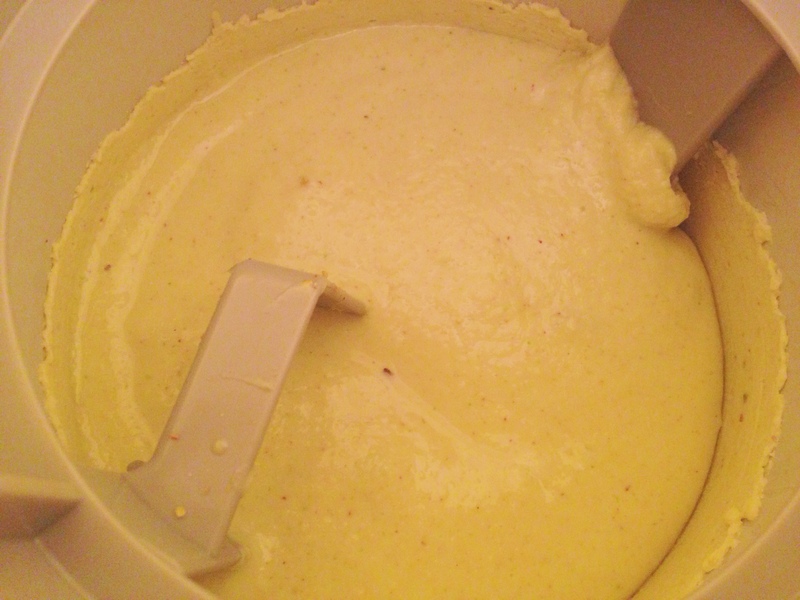 So in the spirit of summer, I set out to make my own homemade pistachio ice cream. There are all different recipes out there. Some call for roasted pistachios, some for raw. There are varying amounts of cream-to-milk ratios and number of egg yolks, if included at all. This recipe results in an incredibly delicious, creamy, sweet pistachio ice cream. To make the ice cream, add one cup of raw pistachios and one cup of sugar to the bowl of a food processor and process until fine. Set pistachio-sugar mix in a mixing bowl and add the egg yolks and almond extract and mix through. Set aside. For the base, I use a 1:1 cream-to-milk ratio. I like this flavor and consistency for homemade ice cream. Any more cream than that, results in an extremely soft ice cream because of the higher fat content and the temperature of home refrigeration. I also use raw, unsalted pistachios to flavor the ice cream and lightly toasted pistachios for the mix-in at the end. Create ice bath with a bowl in it and place a sieve nearby. In a heavy pot on the stove, bring cream, milk and salt to a very high heat, making sure not to boil. Remove the cream from the heat and temper the egg-sugar-pistachio mixture with the hot cream so that the egg yolks do not curdle. Then mix the entire egg-sugar-pistachio mixture to the cream and heat through until hot, but again, make sure it does not boil. Once heated through, remove the cream from the stove and pour it through the sieve and into the bowl in the ice bath. This will stop the cooking process. Let cool and cover with plastic wrap and place in refrigerator until chilled. This can take 2-3 hours but I prefer to keep it in the refrigerator overnight, so the flavor intensifies a bit more. 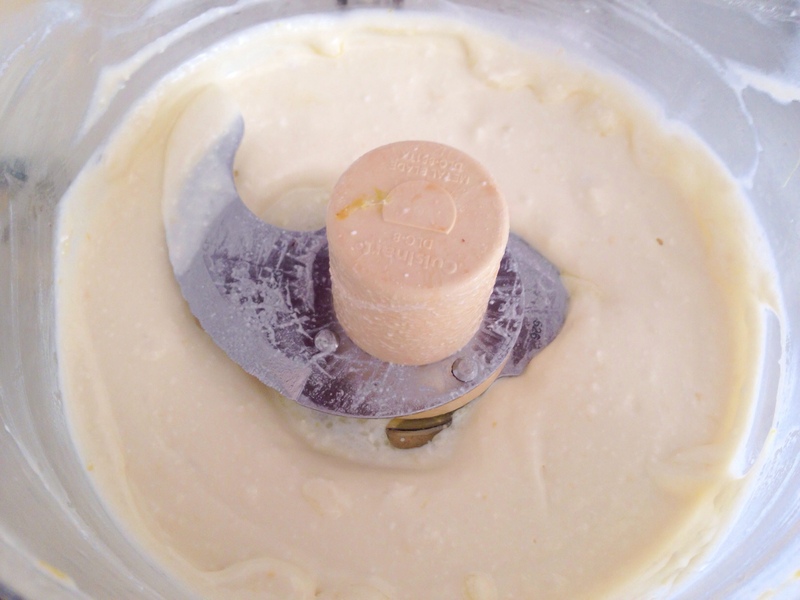 When the cream is chilled, pour it into ice cream maker and let it churn according to directions. As the ice cream is churning, toast remaining pistachios in oven for 2-3 minutes, make sure not to brown, then add to ice cream when just about done so they mix through. When the ice cream is done, move it to a container and freeze for at least two hours, for a harder consistency. 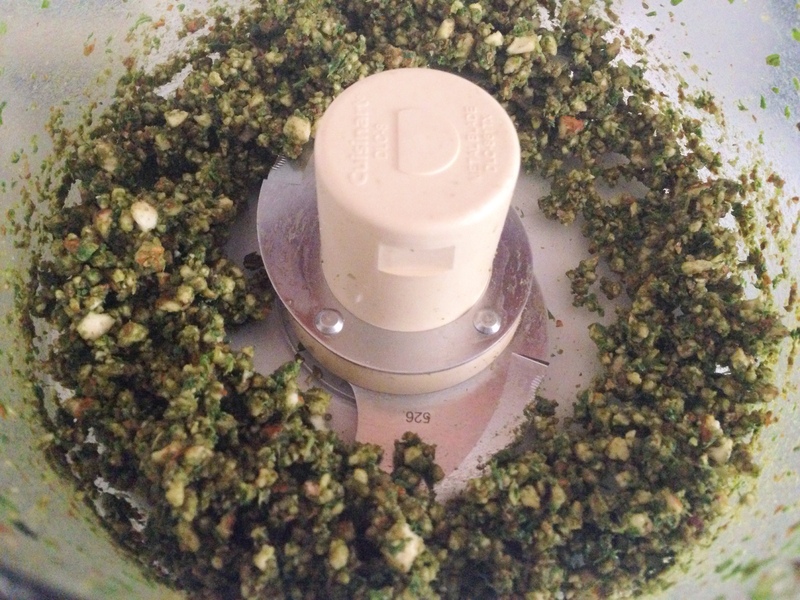 Add one cup of raw pistachios and one cup of sugar to the Bowl of a food processor and process until fine. 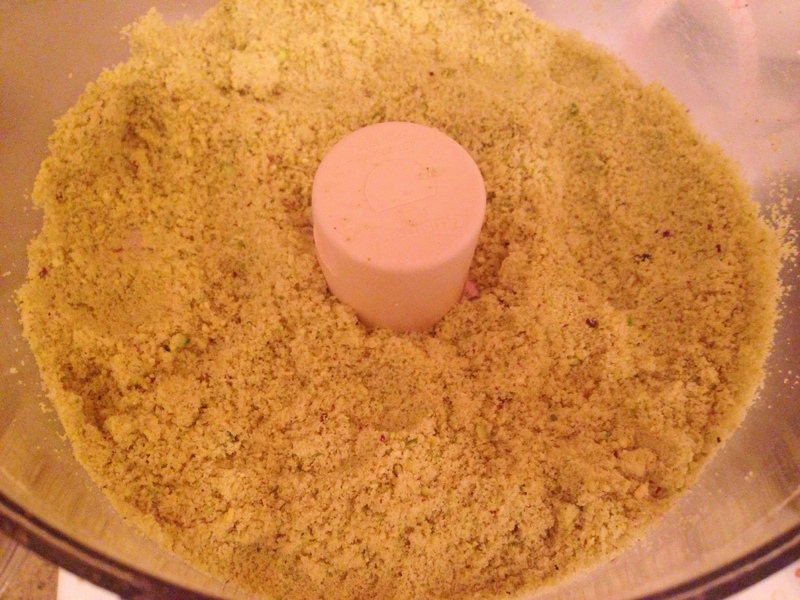 Set pistachio-sugar mix in a mixing bowl and add the egg yolks and almond extract and mix through. Set aside. Create ice bath with a bowl in it and place a sieve nearby. In a heavy pot on the stove, bring cream, milk and salt to a very high heat, making sure not to boil. Remove the cream from the heat and temper the egg-sugar-pistachio mixture with the hot cream so that the egg yolks do not curdle. Then mix the entire egg-sugar-pistachio to the cream mixture and heat through until hot, but again, make sure it does not boil. Once heated through, remove the cream from the stove and pour it through the sieve into the bowl in the ice bath. This will stop the cooking process. Let cool and cover the bowl with plastic wrap and place in refrigerator until chilled for about two-three hours or overnight. When the cream is chilled, pour it into ice cream maker and let it churn according to the directions. As the ice cream is churning, toast remaining pistachios in oven for 2-3 minutes, make sure not to brown, then add to ice cream when just about done so they mix through. When the ice cream is done, move it to a container and freeze for at least two hours, for a harder consistency. 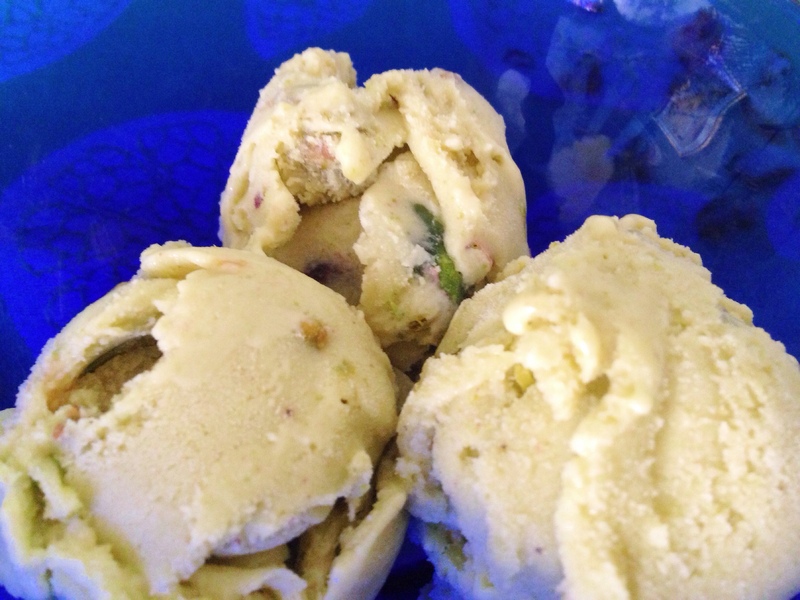 This entry was posted in Blog, Recipes and tagged ice cream, pistachio on July 29, 2014 by Leslie. 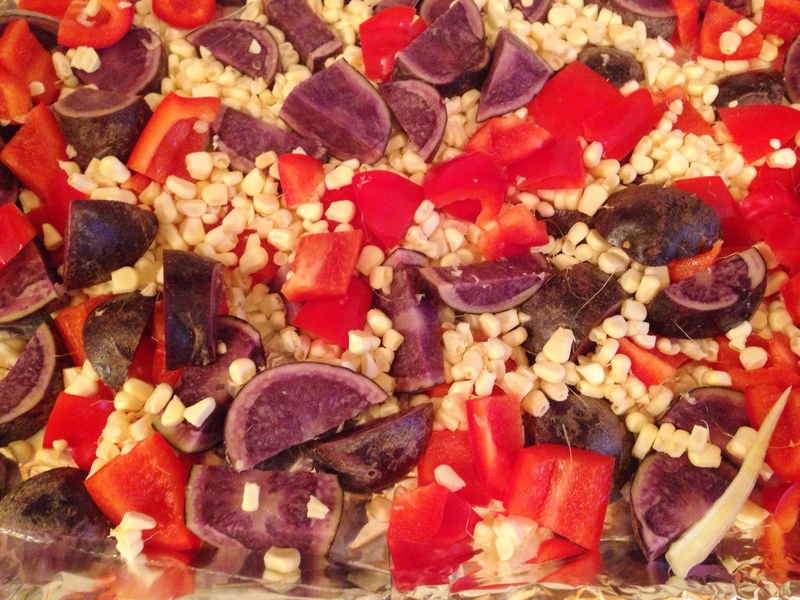 This red pepper, white corn, blue potato medley is a very easy, tasty and vibrant looking side dish. It’s a festive side dish for your Fourth of July barbecue, and it’s good anytime when you can get fresh corn. I use white corn for the symbolic white in the Red, White and Blue theme of Independence Day, but you can easily use yellow corn. Blue potatoes are a bit nuttier in taste than their white sisters and they have more health benefits as they contain antioxidant-rich flavonoids. Freshly chopped rosemary and kosher salt, olive oil and some freshly ground pepper are the only flavors added to the peppers, corn and potatoes. Just cut up the peppers and potatoes and slice the kernels off the cobs of corn and mix with the oil, salt and rosemary, then roast in a 375 oven for 45 minutes. 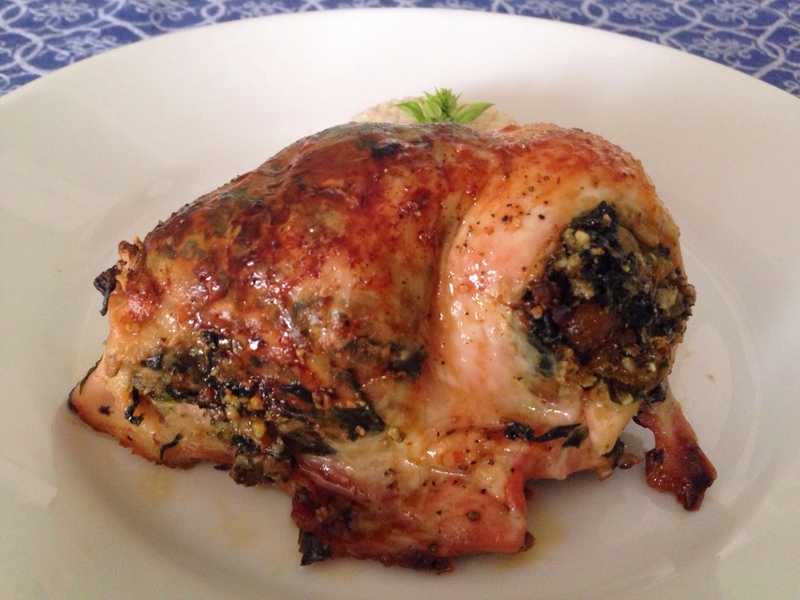 This recipe is good for 4 people, or 8 people if there are other side dishes on the table. You can easily double the recipe. Preheat oven to 375°. Wash and cut the potatoes, keeping skins intact, and add to a roasting pan along with the cut papers and corn kernels. 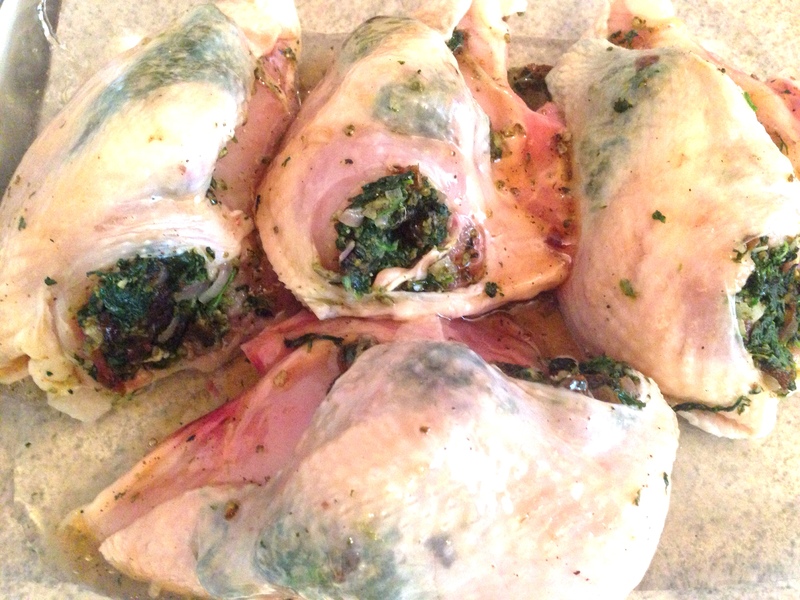 Drizzle oil, rosemary, salt and pepper over the medley, mixing through with your clean hands. Put into oven on rack in middle of oven and roast for 45 minutes, checking and tossing potatoes, peppers and corn once about 25 minutes into cooking. 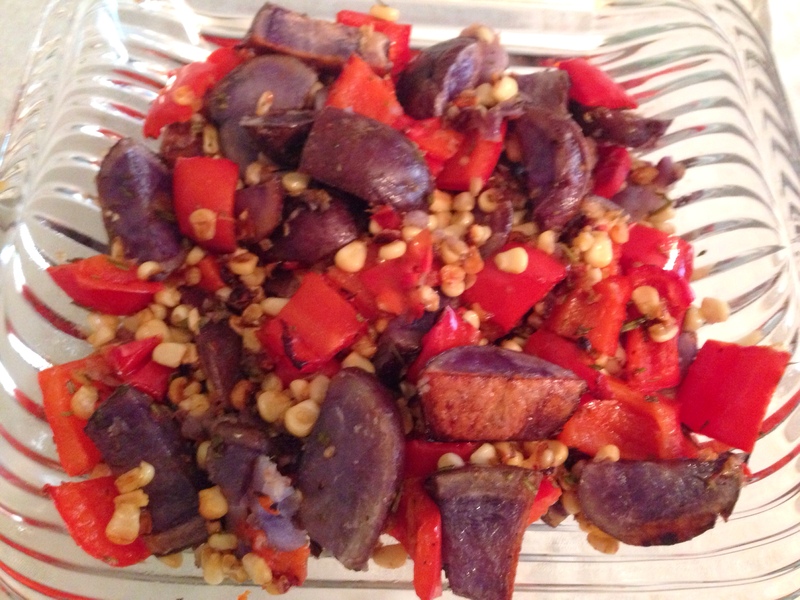 This entry was posted in Blog, Recipes on June 30, 2014 by Leslie.